In the ski industry, our region is known as the “Banana Belt”. Any winter weather expectations are tempered below the New England, New York State line and those of us who long for winter weather experiences so that we can enjoy our winter sports here in Pennsylvania, have it tough sometimes. The only salve for these wounds of expectation is the hope that the weather will turn locally,focusing on our planned ski trips up north and out west, and………watching ski racing on television. I have always been a fan of ski racing because coming from an instructor background, racing shows the ultimate technique required to make a ski turn efficiently. I make an effort to watch NBC Sports, NBC Sports Network, Universal Sports and use the DVR function to watch turns in slow motion to see if there is anything I can glean from watching the world’s best racers. I made efforts in past years to watch ski racing up close and personal, climbing up the sides of courses to see exactly how world class racers maneuver their way through combinations in slalom, as well as see their lines in GS and the Downhill. I remember watching Perrine Pelen race slalom at Waterville Valley back in 1982. 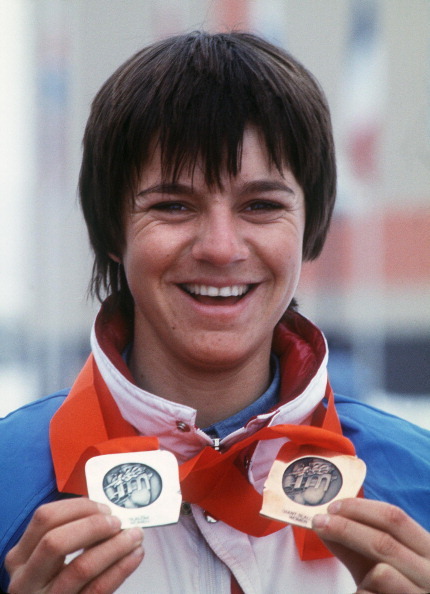 Perrine was an Olympic silver and bronze medalist in slalom, and giant slalom, and won a gold in slalom at the World Championships. I looked at that combination where I was standing and imagined myself going through that particular section of the course.. When Perrine came rocketing through, it was almost too fast to see exactly what she was doing. Any expectation that I had was completely blown away by her world class technique and speed. It was hard to relate. I needed that slow motion function. 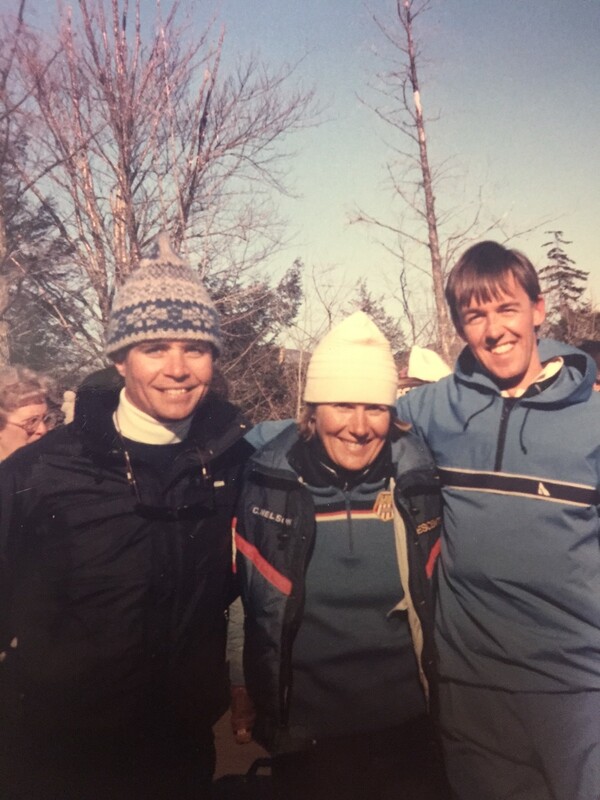 I had a great opportunity to meet our US Ski Team member Cindy Nelson at that race with my buddy Billy Boucher and we had a nice discussion with her on the finer points of racing and what her experiences were at the World Cup level. 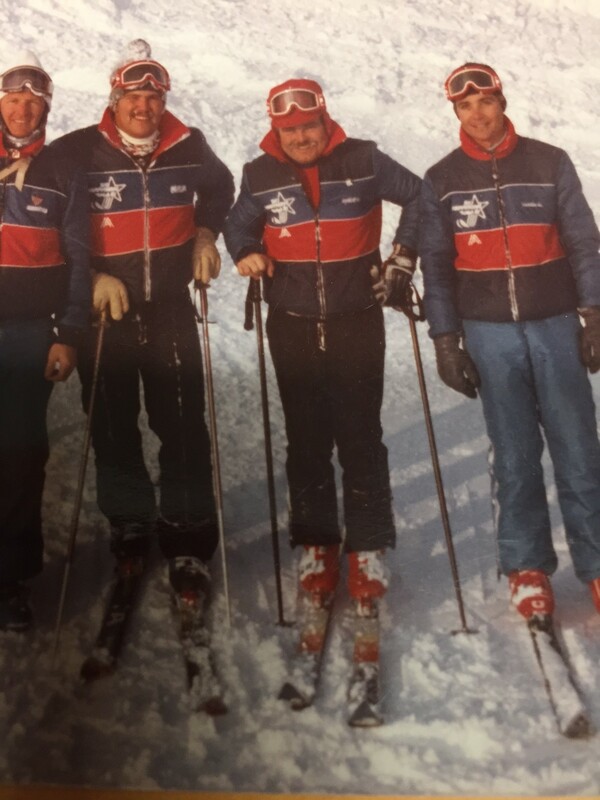 A number of years ago, I had the great experience of being with a group of instructors at an event called “Ski Happyning” in Austria and witnessed the Super Bowl of ski races- the Hahnenkamm. The speed and the treachery of that course was impressive and I learned quickly the value of sharpened edges when I skied the Streif the next day. Last weekend, I watched her impressive win in slalom at Killington on NBC. It was the first time in 25 years that the World Cup was on the East Coast and the crowds were huge.It was not only interesting watching her win in front of thousands of fans, but more importantly in front of her 95 year old grandmother who had never seen her race live. Mikaela is not only extremely confident, but her turns are executed flawlessly. Her timing is perfect as she pressures the skis through a turn and quickly sets up for the next turn high above the next gate. She is never late and as it stands now, she is in a league of her own beating the other ladies by seconds which is light years in ski racing. Her balance is unmatched as she stands perfectly on the skis all the way through the turn. It is really fun to watch. All in all, you can learn a lot from watching any sport executed by the world’s best. Golfers are always watching the swings of the Tour players and trying to emulate what they do correctly. It is the same with skiing. We watch and learn from skiers like Shiffrin, and see what they do especially when you can see it in slow motion. So, as I wait for the snow and placate myself with muddy mountain bike rides at night or on above frigid weekend days, I hope for the best. The equipment is sitting there waiting, the trips are planned, all we need are the HKD guns to start blasting locally and with a little luck from mother nature, maybe just maybe, we can apply what we learn from watching before Christmas. Think snow, even if you don’t ski or like winter…..it is beautiful to see. A landscape that is blanketed in snow is a visual wonder. Thanks for reading. 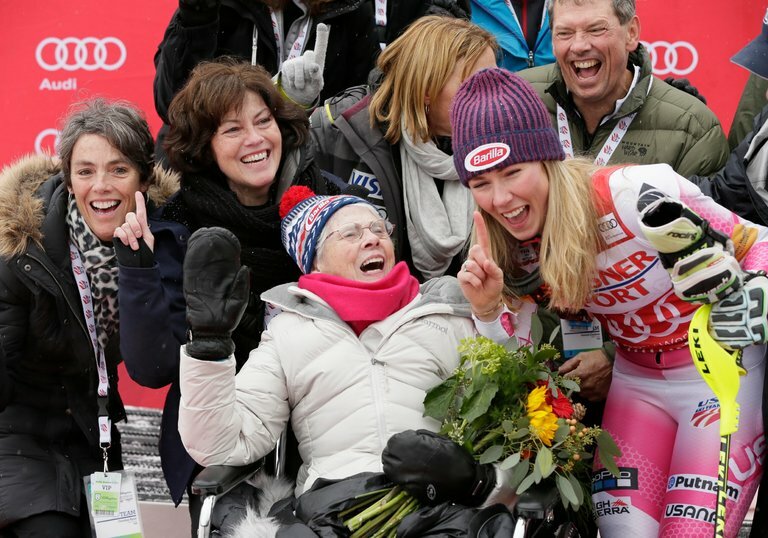 Photo of Mikaela Shiffrin and family- Erich Schlegel- USA Today Sports, via Reuters. Video – US Ski Team videos. This entry was posted in outdoor activities, outdoor sports, recreation, Skiing, Television, Winter, winter sports and tagged Austrian Tourism, Hahnenkamm Downhill, HKD Snowmaking, Killington Resort, NBC Sports, Universal Sports, Waterville Valley. Great read as usual about the snow and east coast. Well, not much out here either and some are openning, but WP is slim. A werid weather pattern for sure. Tenn. sure could use the moisture, right? Really sad to watch what has happened there. I did watch Michaela over the weekend and was like , wow, she won it. And saw the grandma watching live for the first time. Emotional for sure. Still subbing in special ed. as much as I can find in the JeffCo school district and love doing this to help these students that have major issues, I mean major!!!!!!!!!!!! We also took out house off the market as we couldn’t get what we wanted or need to buy outright in cash on the new home. Alot of “fix and flippers” low-balling us $25,000-$30,000 less than asking price. We will put it back on in late March as the CO market is still hot and we want to find that nice ranch home, all on one level, living. It is scarey to move and try to get it together and find the new home. We might have to look at townhomes if needed. I would rather have a single standing home, but……….. Anyway, take care buddy and hope your Thanksgiving was good. We had 18 people here at the haus. 3 fried turkeys, etdc. Yikes! Later my man and hope to see you if you come this way someday this year. Great article as always. I enjoy the read. Just wanted to point out the word “penultimate”. It actually means next to last not beyond ultimate. I once won a bet arguing the meaning of this word. So in this situation you should just use “ultimate” as there is nothing greater. Just FYI! Keep posting! Well you’ve done it again sitting here watching ski videos instead of driving up to the high mountains today. Yes, I’m just outside of Denver and will get up to Vail midday. Love to watch Michaela ski, just incredible the way she stays over the middle of those skis and they’re always bending from the middle using the whole ski! You’re right about slow mo it’s really fun to watch. It’s a little week on snow out here too but getting better, I hope the weather changes for 7 Springs so they can get some good snowmaking in. Thanks for this post, love the photos. You got me pumped, I’ll keep you posted, thanks. Pat as always a good thinking read. yes our US Ski team is kicking it ,and wow Michiaela is crushing those ski slopes ,and just wait Ms Vonnn will be back soon enough. yes hoping for snow ,just love the beauty and all the fun we can have ! Let it snow ! Watching the world cup at Killington this weekend made me proud to be a Vermonter Pat! The snow and hill were fantastic! The logistics of parking and crowd control was great too! Killington really hit a home run with this one! And horay for Michaela who learned to ski on little Storrs Hill, vertical 300 feet in Lebanon Nh.